ford madox brown | Bustling along bookshelves . . . This could be called the Story of a Printing Press. Except that there is more than one printing press. It could also be a story about a family – only, there is more than one family. It might be the story of one particular address – and yet, that too changes. It could also be about anarchists. It is certainly about writers. Writers with quite an artistic and literary pedigree. When does it start? I had thought to begin with the late 19th century; but really it could be said to originate in the 1830s when Italian writer and scholar Gaetano Polidori, by then residing in London, set up a printing press at his home near Regent’s Park and proceeded to print, among other things, the early work of his grandchildren: Maria, Christina, Dante Gabriel and William Michael Rossetti. His eldest son (uncle to Dante and William) was that same John Polidori who became physician to Lord Byron and author of The Vampyre, the first of its kind. Interesting to note that Lord Ruthven, the vampire of the novella, was based on Lord Byron, just as Bram Stoker’s Dracula was based on Henry Irving – inspired by that same draining quality on the energies of the people surrounding them. As much a social commentary as gothic fiction, it is tempting to see in The Vampyre an anticipation of the later Rossettian social conscience in John’s nephews and nieces. The two sisters we know went on to write poems and act as models for Pre-Raphaelite opiate-ingesting Dante. Poor Dante. His drawing, anatomically never terribly brilliant, took on near nightmarish qualities as laudanum, alcohol and mental instability progressed – not unlike Friedrich or Blake in its solidity, yet weightier: – a tangible expression of the oppression brought on by his mental and physical health. William Michael, by direct contrast, after briefly appearing in one or two paintings, went on to become writer, critic and, along with Dante, fellow founder of the Pre-Raphaelite Brotherhood in 1848; in the same year, Dante began studying under Ford Madox Brown, whose daughter Lucy later married William Rossetti. The network was growing, with a fair amount of cultural overlap – artists with writers and the occasional politician (Burne-Jones, Kipling, Baldwin and Poynter were all connected by marriage). Within the following few years, social revolution and anarchism were bubbling across Europe; the seeds sown by Proudhon gained momentum with Marx, Bakunin, Kropotkin, with its artistic counterpart represented by such movements as the Pre-Raphaelites. 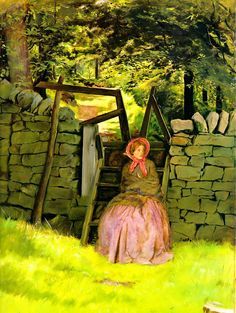 In 1853, Millais painted The Stile. In 1854, co-founder member Holman Hunt, produced The Awakening Conscience. Both of these caused quite a stir in their social commentary and symbolism, while contemporaneously in Smolensk a 12-year-old aristocrat called Peter Kropotkin renounced his title of Prince as a result of his republican education. He continued in his beliefs into adulthood, and furthermore, began to share his thoughts through writing and lecturing. In 1874, the year William Rossetti married Lucy, Kropotkin was arrested and imprisoned in the Peter and Paul fortress as a direct result of his teachings. He escaped from imprisonment in Russia and reached London, where he settled for a time, giving lectures on Anarchism. In 1880 he wrote ‘Appeal to the Young’, a brief and brutally honest critique of living conditions for both rich and poor; by this time, William and Lucy had a family of five; the three eldest of the Rossetti children read it and decided to establish ‘The Torch’ in 1891. It was initially hand written, with small circulation. Kropotkin travelled from Acton to visit their family home in St Edmund’s Terrace and was presented with a paper by Olivia (Isabel)to sign, regarding the political platform of the Torch. The anarchist was delighted to do so. (He appears, disguised as Count Voratin, in A Girl Among the Anarchists). The Rossetti children later had tea with him in the British Museum (there were Thursday ‘At Homes’ held by Mrs Garnett in the east wing of her new address at the Museum). In 1881 he lectured at the International Congress of Anarchists, on which is based the meeting described in the opening extract from Of Soul Sincere. By the late 1880s, Ford Madox Brown was residing at Number One St Edmund’s Street. In 1890, his neighbours the Garrets moved to official residence at the British Museum, and the Rossetti brood moved into the newly vacated Number Three St Edmund’s Street. It was an unorthodox household; free from the trammels of religion, in a domestic environment where freedom and expression of thought were actively encouraged, it was hardly surprising to find the children developing eclectic interests as much in politics as in the arts. Ford Maddox Brown continued to be closely connected: as father-in-law and neighbour (from 1890 on)to William Michael Rossetti, and as grandfather to Ford Maddox Ford, supposedly the friend from whom Conrad in casual conversation one day heard the words regarding anarchist activities: ‘Oh, that fellow was half an idiot. His sister committed suicide afterwards.’ Ford later re-wrote the words, and suggested he knew a great many anarchists and a great many of the police who watched them; he would, as cousin to the Rossetti children and as neighbour, have been well aware of the various anarchists who visited the Rossetti domicile. Conrad visited William Rossetti the late 1890s or early 1900s, (possibly to discuss Nostromo) – Helen, the younger sister, recalled the occasion. She was by then twenty; he did not, according to her, meet Olivia(Isabel) although he may well have based his Lady Amateur in The Informer (1906)on her. He mentions The Torch in the first chapter of the Secret Agent(1907). The Torch was by no means alone(see footnote below); it is interesting for its literary connections and the germs for narrative that were supplied as a result (The Girl Among the Anarchists, The Secret Agent, An Anarchist,The Informer). The Rossetti connection ended finally in 1896 and the press was handed over to Thomas Cantwell. Life had taken over, or perhaps as described in the Girl Among the Anarchists, the Rossetti children had outgrown it. Kropotkin continued to be involved with the Freedom press for a while until theoretical disputes within the organisation caused him to part ways. The broken wall: if it is meant to be symbolic, then it could be suggestive of lost virginity – elsewhere it has been suggested that the wall represents a boundary, a form of innocence. If the sitter is indeed Effie Gray, as has also been suggested, the fact that Millais is painting her unchaperoned, in such a scenario, when she was trapped in an unconsummated marriage, offer even more interpretations, especially as Millais became her lover and eventual second husband. In another interpretation the stile she sits upon acts as the stepping stone, or portal, of the wall; beyond it the viewer is treated to another landscape, fresh, green, apparently uncontrolled – a horizon of desire for freedom, perhaps, a hint at a more positive future. (If the model was instead Annie Miller, as has also been suggested, the symbolism does not change – he had taken her under his wing and educated her with a view to marriage – the relationship did not change until the 1860s when he decided she was unsuitable). 1853 : The Order of Release has Effie as the wife – but who is the wounded soldier husband she has rescued? Ruskin or Millais ?